I don’t know about the rest of you, but free motion quilting sometimes frustrates me. I can stipple with the best of them. But to do anything else, it’s a challenge. Sometimes a project will languish in my sewing room because I can’t bring myself to quilt it. I don’t want to ruin it! Well, I am determined to get over this hurdle. 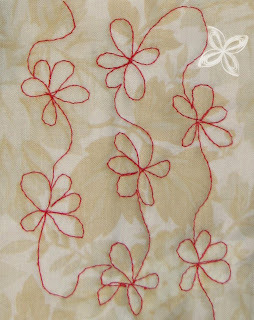 To that end, I’m going to try Jen Eskridge’s tutorial on free motion quilting a flower motif. Jen is the owner of ReannaLily Designs and one of our pattern designers. She has a great tutorial on her blog about how to produce these little flower. I’m going to give it a shot. Wish me luck! This entry was posted in Techniques and tagged Machine Quilting. Bookmark the permalink.